We all experience gastroesophageal reflux (GER) on a daily basis, as part of the normal “housekeeping” mechanism of our digestive tract. Reflux is simply the backward flow of stomach contents (liquids, including food matter, digestive juices, and acid, as well as gas) toward the esophagus. We may feel this as a “sour” burp, “acid” taste in the throat or mouth, or heartburn. When these symptoms become very frequent, disruptive or complicated, your doctor may add a “D” for “Disease,” and diagnose you with GERD. These complications in adult patients may include chronic inflammation or injury to the lining of the esophagus, resulting in reflux esophagitis, which increases the risk for scarring and even esophageal cancer. In children, GERD can negatively impact feeding, swallowing and weight gain, and can be a trigger for chronic cough. GERD can be especially problematic for patients with asthma. Studies have shown that over 75 percent of adults and 50 percent of children with asthma also have GERD. Droplets of the refluxed matter trigger a nerve reflex, which causes airways to narrow, producing cough and wheezing. 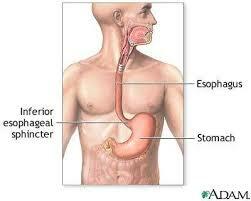 Uncontrolled GERD can worsen asthma symptoms acutely, and, in the long term, cause damage to the airway lining. Conversely, asthma, as well as certain asthma medications, may worsen the symptoms of GERD. If asthma symptoms worsen after meals or when lying down, or asthma medications are not working as well as expected, GERD may be a major trigger. Optimizing the treatment of GERD with dietary and lifestyle measures, and judicious use of effective medications, has been shown to improve control of asthma in cases where the conditions coexist.